With KW Commercial specialists, you have a network of talented and committed people all working towards a common goal: success for your business. We use our individual expertise, combined with access to market intelligence that few companies can match to help you achieve and surpass your business goals. Industrial property owners can also rely on KW Commercial's network of associates to assist in the marketing of their industrial property and ensure the property is sold for the best price as quickly as possible. Finding the right office space entails many considerations and complications beyond simply finding the right location. Office tenant representation demands knowledge of local market conditions and trends, as well as a keen set of negotiating skills to successfully structure a client's lease document. Tracking rents, rent concessions, operating expense pass throughs, changes in technology and other factors are part of what our KW Commercial Office Property associates are dedicated to knowing. Commercial landlords can also rely on our associates to have intimate knowledge of the local office market and existing tenant base in order to successfully lease office projects at the highest rental structure possible. Representing buyers and sellers of investment real estate requires local market knowledge, knowledge of financing instruments and capital markets both domestically and abroad. KW Commercial's Investment Properties associates keep abreast of the latest trends and fluctuations in equity and debt markets, as well as local and national cap rates. Our vast network of international, private and institutional investors allows us to match our clients with the right investment opportunity, and maximize return on the investment. For our retail user and developer clients, the advantages of partnering with a KW Commercial Retail Properties associate are significant. Whether leasing a retail strip center or finding a new facility for a restaurant customer; location, speed to market and economic performance are as important to us as they are to our clients. 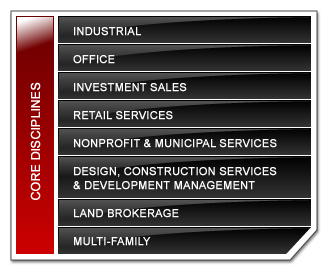 Nonprofit organizations, school systems and government agencies have unique real estate requirements, and our KW Commercial associates understand how to best serve these organizations. We understand the unique budget constraints and the multiple stakeholder environment in which they operate. Portfolio assessment, real estate strategy, financing and project management are critical to our education and municipal clients, and we deliver. Building on time and on budget are two passions of our KW Commercial Construction and Development Management associates. To ensure the best outcome for our clients, KW Commercial has an extensive network of experienced construction professionals who provide effective leadership, sharp attention to detail and a valued partnership. KW Commercial also has broad-based strategic alliances with fee developers capable of overseeing and managing any type of real estate development. Our partners, who are established in local markets across United States. and Canada, can guide our clients through governmental approvals for both small and large development projects. KW Commercial associates specializing in land brokerage and assemblage possess an exceptional understanding of the complex factors that influence the land brokerage transaction and have the extensive experience and contacts to get the deal done right. Our associates provide solutions based on constantly evolving factors such as zoning and regulatory issues, demographic and traffic patterns, and overall political and economic trends. Expanding on the fundamentals of land brokerage, our associates ensure that the client's unique business considerations are addressed and that the negotiation process is a win-win. Working in coordination with our other specialties, our land brokerage services offer a solid and well-rounded approach to land acquisition and disposition. KW Commercial associates provide multi-family owners and investors with market knowledge, research, financing and analysis of market trends in vacancy, rent escalations, comparable cap rates and buyer trends. Our associates have expertise in sales, acquisition, development, finance and valuation, which extends to conventional apartment properties, condo development and conversions, student housing and residential income development land. Whether you are selling a single asset or national portfolio, our associates provide you with unparalleled market information and will achieve the highest level of results. If expanding your portfolio is the objective, our local experts can help you identify and acquire properties which meet or exceed your investment goals. And it doesn't stop there. Whether the next steps are finding the right property management company, providing current rental and vacancy data, assessing local rent control issues or assisting with tenant leasing, our associates continue to be a valued resource.